Living in Springfield, Missouri for the last seven years of my life has presented me with many surprising and unique experiences. One of these experiences is the sheer amount of churches in this city. Springfield is a city of about 160,000 people, and at times it feels like there are that many churches. This shouldn’t come as a surprise, as Springfield is the bright shiny buckle of the Bible Belt. The Bible Belt is an extremely conservative section of the country. I would venture to say that it is impossible to drive for more than a mile without passing at least one church. With the quickest of Google searches, you can easily find churches in almost any denomination, ranging from Baptist to Seventh-Day Adventist, Presbyterian to Nondenominational, Methodist to Episcopal, and so on. While each denomination holds its own separate and unique views and values from the other, the reality is that all of the churches in Springfield seem to share one value together; judgment and exclusion. Don’t get me wrong, Springfield has many great aspects; far too many to list here. However, the sense of judgment and exclusion is palpable and persistent. Try eating dinner at one of Springfield’s many restaurants. This shouldn’t and doesn’t pose any difficulties for most of Springfield’s residents. Now try doing the same feat with visible tattoos or being a person of color. Sure, you’ll still get your main course, but you’ll also receive a free side of looks from everyone in the restaurant with a complimentary dessert of whispers behind your back. Don’t forget to keep geographical location in mind too when deciding what restaurant you’ll be dining at. Anything in south or central Springfield is fine and dandy but be sure to avoid the north side of town. Why? Because the people in north Springfield are poor and if you’re not careful you might have a homeless person talk to you! Here in Springfield, different is scary. If your skin isn’t the same color as mine, if you dress differently than me, or if you hold different beliefs than me you are a threat. Plain and simple. Think back to what I mentioned in my opening paragraph. 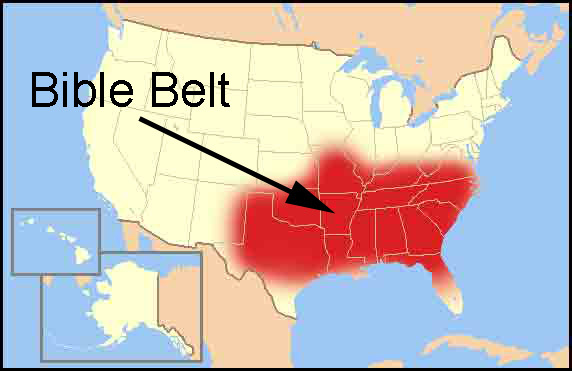 Springfield is the buckle of the Bible Belt. This means that a vast majority of the residents of this city are involved in church one way or the other. A frightening thought is that many of these residents may be carrying their beliefs that different is scary into their churches with them. Different isn’t scary, different is simply different. An individual’s appearance or beliefs should in no way impact how others view them, but the unfortunate reality is that it does. When I first moved to Springfield, I assigned myself the task of finding a new church. My plan was to continue attending churches until I found one that fit for me. I assumed that this would be an easy task, given the overwhelming amount of churches in Springfield, but I was wrong. Now is probably a good time to mention that I have tattoos. And please forgive me, but I have some tattoos that are visible when I wear a short sleeve shirt. I set off on my quest to find a new church for myself, but I seemed to continue encountering the same problem at each church. I was a new attendee, but instead of having members of the church come introduce themselves to me, I received looks of fear and dread from the startled onlookers. “What is that tattooed heathen doing in our presence?” While no one came out and directly said that to me, it was made apparent to me through actions that I was different from most of the other people in attendance. I clearly felt like an outsider because I didn’t fit the typical ‘church look’. Out of all of the churches I visited, I never once felt like a welcomed visitor. Instead, I felt like the relative who has overstayed their welcome during the holidays; people could see that I was there, but they were waiting for me to leave. It was quite a lonely feeling. Eventually it got to the point where this experience was becoming too exhausting for me to go through, so I stopped looking for a new church. I assumed that if I hadn’t been accepted yet, what was going to change? I lost hope because of my experience with judgment and exclusion. Where was the unconditional acceptance? Where were the open and inviting arms? Where was the come as you are attitude? Must I fit into the ‘church look’ to be welcomed? I understand that Christianity is at its core exclusionary; some of its core beliefs are that Christ died for your sins, was buried, and was resurrected three days later. Individuals who believe in these things will go to heaven when they die, those who don’t will go to hell (please forgive my VERY abbreviated explanation of Christianity). When it comes down to it, there are very clear boundaries set in place on who’s in and who’s out when it comes to Christianity, however we must make a conscious effort not to cast judgment and exclusion on others, as that is not our role. Ultimately God will make the finals judgment. I try, but am not always successful, to look at things from the perspective of Christ when it comes to interacting and engaging with others. There are numerous examples in scripture of Christ sitting down and eating, talking, or simply paying attention to tax collectors, the poor, the sick, and even prostitutes. Romans 15:7 comes to mind as I’m typing this entry. It states, “Therefore, welcome on another as Christ has welcomed you, for the glory of God.” This verse is unbelievably powerful to me. If we were to welcome each other as Christ welcomed us, I wonder the impact this would have on church visitors. Christ accepted us as we are, should we not do the same to new comers? Eventually, a friend of mine was able to point me in the direction of a church that was welcoming of its new comers, and for the first time since moving to Springfield, I felt welcomed. I didn’t have to put on my church face every Sunday morning to make every one else comfortable. After becoming a member of this church and discussing how I could increase my involvement in the church, I discovered that a simple responsibility that some church members have taken on was to form a welcome team. This team simply stands by the front door and greets guests as they come in. This is such a small task, but the impact is huge. By simply having someone talk with you and welcome you into the building, guests and visitors are being reminded that they are welcome to worship God as they are. This entry was posted in michael bobbitt and tagged acceptance, church, culture, judgment. Bookmark the permalink. I could not help but think of Jesus walking into towns and synagogues feeling many of the same emotions you did when visiting the churches of Springfield. Only, I believe his reaction was different than yours. Instead of being turned away by the harsh gazes of the “insiders” he stuck around and loved them. He actually went where he was most UNcomfortable because those are the people who need him the most (whether they are sporting tattoos or tailored suits). In talking with people about selecting a church, I often give the advice to go where you and the church will experience the most spiritual growth because of your membership and involvement. This almost necessitates going to a place that challenges us, instead of a place where we can feel comfortable. Of course, it’s great to be nourished by the church but each of us needs to find a healthy balance of comfort and challenges in the churches we attend. Good post. Thanks for sharing your story. Sorry that getting connected was such a pain. … as periphery to your main point, church shopping always rubs me the wrong way in general because there tends to be a dual evaluation going on; rather both “sides” need to be active in pursuit as neither side is the focus of Church. … “an individual’s appearance or beliefs should in no way impact how others view them, but the unfortunate reality is that it does.” I think it should, but I think it should impact in a Christ centered way, seeking to understand and love, not in a way based out of fear or elitism. … in agreement with the heart of your words about loving others different than ourselves, being hospitable and welcoming, and that ultimately God will make the final judgment. Mark – That’s a really interesting point, one that I can say I had not thought of before. I think it is important to be in a place that consistently challenges you, because it is so easy to fall into complacency. Justin – I agree. Church shopping can definitely lead us astray from the pursuit of seeking Christ as we often times focus on comfort. Great blog Mike. Thank you for sharing what is on your heart. I, too, am a believer and was very involved in churches in the past. After moving here I became involved, served and was employed at my church. Over the next couple of years as word spread that did not hold similar political beliefs I was shunned. It’s been almost a year since I have attended a church. Sometimes I think that as believers we are God’s worst representative, in the way we treat others. I’m considering starting, once again, a hunt for an accepting church. I’m so glad you found one where you feel welcome and will hopefully feel led to become involved. You have so much to offer. Mike…really enjoyed reading your post, and have had similar churchy experiences. Question though…when we deem a church cold and unwelcoming, are we not pre-emptively and/or reactionarily judging and excluding ourselves? I’d love to hear your thoughts about how to extend love to people held in fear of people like you and me with tattoos, beards and homebrew habits. Yeah, someone on Reddit asked a similar question. And yes, you are absolutely correct when you say that my reaction is a judgment as well. I’m essentially saying, “I can’t trust these people”. I think the most simple way to show love to others is by displaying resiliency and patience through Christ’s love. The love of Christ is filled with both of these qualities, and many more. I had a discussion recently about how some level of discomfort may not be a bad thing, as it allows us to avoid complacency. If we fall into complacency, then we can more easily loses focus that church is not about our comfort levels, but about glorifying God.